While Nintendo Power managed the official announcement of the Wii remake of the original Silent Hill as Shattered Memories, Konami handles announcing it for PlayStation 2 and PSP. 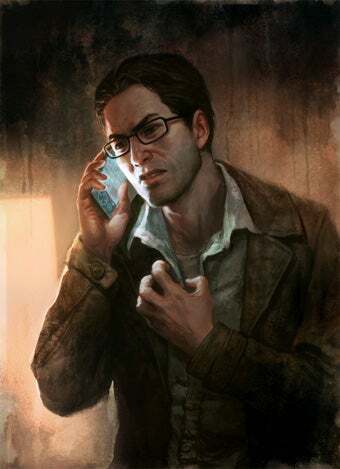 As mentioned in McWhertor's post on the Wii version, Silent Hill: Shattered Memories is a retelling of the original Silent Hill game, with the objectives shuffled about and the dialogue changed to keep gamers on their toes. Harry Mason is still looking for his missing daughter, but how he goes about finding her has definitely changed. Especially in the Wii version, where the Wii remote will be used as a flashlight, a cell phone with GPS mapping capabilities (turn left to evil), and to pick up an manipulate objects to assist in puzzle solving. Also new to the series is a psyche profile element, which will monitor the player's behavior - where they explore, the dialogue they choose - and modify visual elements and Harry's reactions as the game goes on. Depending on how it is implemented, it could me no two players have exactly the same experience, and if they do, they should totally get married. Silent Hill: Shattered Memories will be release this fall for the Wii, PlayStation 2, and PSP.